Whether it's your first anniversary or fifteen year anniversary of enrolling in the Sandals Select programme as a member, we want to thank you and let you know your loyalty means everything to our brand. That's why we are giving you a gift of 5,000 points to use instantly towards your next booking when you book any Sandals or Beaches during the Enrollment Milestone month. Wouldn't a trip to Sandals or Beaches make it your best birthday ever? Book within the month of your birthday for travel anytime and instantly redeem 5,000 Sandals Select Rewards bonus points to use towards your Sandals and Beaches booking. Use Promo Code SSGBDAY when making your booking. This offer is not combinable with any other Sandals Select Rewards promotions but is combinable with all of our Standard Resort Promotions and Loyalty and Travel discounts. This promotion is also subject to our Standard Promotional Conditions. In addition this promotion is subject to the conditions set out by our Standard Disclaimers. Birthday Bonus Promotion – SSGBDAY is valid on new bookings only made within your Birthday month. 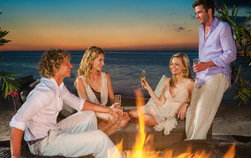 Bookings must be stays of 4 paid nights or longer in any room category at any Sandals or Beaches resort. Excludes bookings made at Sandals Inn. Your 5,000 bonus points are available for immediate redemption. Please call 0800–197–8946 Non–combinable with other points offers. This offer is capacity controlled and can be withdrawn without notice. Not responsible for omissions or errors. Standard Blackout Dates Apply. This offer is not combinable with any other Sandals Select Rewards promotions but is combinable with all Standard Promotions and Loyalty and Travel discounts.